The Old Testament was originally written in Hebrew, with some portions in Aramaic, while the New Testament was written in Greek. The Old Testament had already been translated into Greek before the time of Jesus and the Apostles, so the early church had their entire Bible in Greek. Not surprisingly, the Bible was also translated into Latin, the language of the Roman Empire. The Roman church’s official Latin translation, the Vulgate, was completed early in the fifth century AD. The Bible was translated in part or in whole into many European and African languages over the ensuing centuries, either from Latin or from Greek. But it wasn’t until the 1380s that the whole Bible appeared in English. John Wycliffe, Nicolas of Hereford and other Oxford scholars produced two translations from the Vulgate: the first, very literal, and the latter, much more idiomatic. But neither Wycliffe’s translations nor his teachings were well received by the authorities, and both were outlawed. Johannes Gutenberg refined movable type around 1449 and began printing the Latin Vulgate in 1452. By the end of the century, the Bible had been printed in 11 different languages. Moved by his desire to see every Christian with a Bible in hand, William Tyndale produced the first English New Testament, translated from the Greek, in 1526. Because he did this without the permission of the Roman Church, his translations were destroyed (only two survive). Tyndale was eventually strangled and burned at the stake in 1536. But before his martyrdom, he published the Pentateuch (Gen–Deut), Jonah, and two revised New Testaments, and left Joshua through 2 Chronicles in manuscript form. Tyndale worked in Germany because England was too dangerous. But his associate, Miles Coverdale, managed to publish the first complete English Bible in England in 1535. He combined both Tyndale’s Pentateuch and New Testament with his own translation of the Latin and Luther’s famous German Bible. Coverdale’s Bible was officially licensed. Revisions of Tyndale and Coverdale appeared in editions by John Rogers (Matthew’s Bible, 1537) and Richard Taverner (1539). Coverdale’s own revision of Matthew’s, known as the Great Bible, was also published in 1539 and became the first authorized English Bible. The first English Bible translated from the Hebrew and Aramaic Old Testament and Greek New Testament was published in 1560 by English expatriates working in John Calvin’s Geneva. The Geneva Bible became the most popular translation of its time and went through at least 140 different printings over the next 80 years. A revision of the Great Bible done by bishops of the Church of England, called the Bishops’ Bible, appeared in 1568. And Roman Catholic scholars produced an English translation of the Latin New Testament, published in Rheims, France, in 1582. The Old Testament soon followed in Douay in 1609–10. Following the pattern of Luther’s German Bibles of 1522–34, the English translations had many explanatory notes, often condemning teachings of the Roman Church and sometimes challenging the English monarchy. When James VI of Scotland became James I of England in 1603, one of his first tasks was to satisfy the English churches’ demands to have a single English Bible without notes, except to explain alternative translations or similar texts. In 1604, at a conference in Hampton Court, James gave permission for this new translation to be produced by six panels of “learned men” working at Oxford, Cambridge and Westminster. The 48 to 54 translators were actually revisers, who based their work on the Bishops’ Bible in light of the original languages and the other major translations of the 16th century. The translation sponsored by (not written by) King James was published in two separate editions in 1611. As had all the English Bibles before it, the new version contained the Old and New Testaments with the 14 books of the Apocrypha between the testaments. Though not recognized by the Church of England (or Lutherans or other Protestants) as authoritative for doctrine or teaching, the books of the Apocrypha were part of the Greek and Latin Bibles and continued to appear in most English Bibles well into the nineteenth century. It took nearly a generation for the new translation to replace the popular Geneva Bible, which was last printed in 1644 (outside of facsimile editions). Although there are no documents officially authorizing the KJV, it became known as the Authorized Version—the title page simply states “Appointed to be read in Churches.” Because of its association with James I, it is now known as the King James Version. There were many translations by individuals over the next centuries, but it was not until 1881 (New Testament), 1885 (Old Testament) and 1895 (Apocrypha) that an official church translation was published in England: the Revised Version. The American Standard Version of 1901 was its American edition. 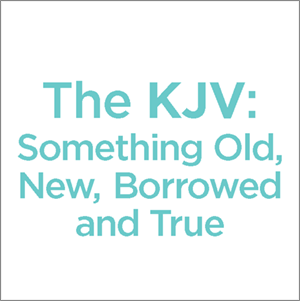 Both versions were revisions of the KJV, as was the more-popular Revised Standard Version of 1946 (New Testament), 1952 (Old Testament), and 1957/77 (Apocrypha). The second half of the 20th century saw an explosion of English Bible translations, but it took until the mid-1980s for the KJV to be surpassed in new Bible sales by the New International Version (NIV). “The scribes and the Pharisees sit in Moses’ seat: All therefore whatsoever they bid you observe, that observe and do; but do not ye after their works: for they say, and do not” (Matt 23:2–3 KJV). A Textual History of the King James Bible by David Norton.